This project was a renovation of a 100 square meter condominium on the 10th floor of a 40 year old mid-rise building. The new plan was limited by the presence of two concrete interior walls and a concrete service shaft which could not be taken out because of condominium regulations. 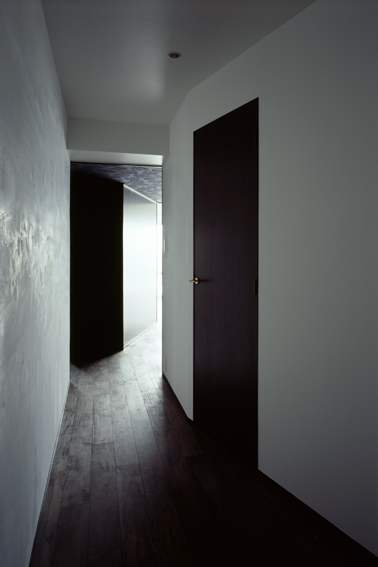 Unable to fundamentally alter the standard hallway / living-dining-kitchen (in Japan abbreviated as LDK) plan structure – in particular the LDK spaces – the question we faced was how to create interesting architecture despite these limitations? By focusing on the design of the hallway space (rather than the LDK spaces), we have discovered new possibilities within this restrictive condominium framework. 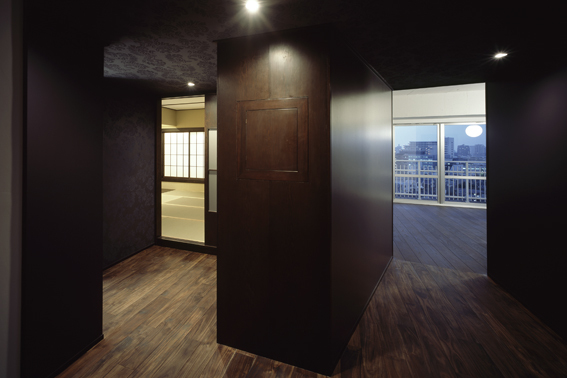 In a typical Japanese condominium, the hallway space receives little natural light and is commonly seen as “wasted area” to be minimized. In this case, we decided to address the hall space in a more positive fashion, actively extending and transforming it. Though hallways are dark, they can serve perfectly well as storage use – in one sense, like extended closets. In this case, by extending the hall space, and then giving this elongated space a variety of angled walls, a lower ceiling height and darkened finishes, we created a sense of anticipation and contrast to the living spaces beyond. One must first pass through this dark, dragon-shaped extended closet before arriving at the well-lit living, dining, kitchen, and bedrooms. We worked primarily with two themes to give special character to the hallway: “delicate” scale and “hidden” space. To create it a sense of “delicacy,” we adjusted not only its dimensions, but also its surface textures. 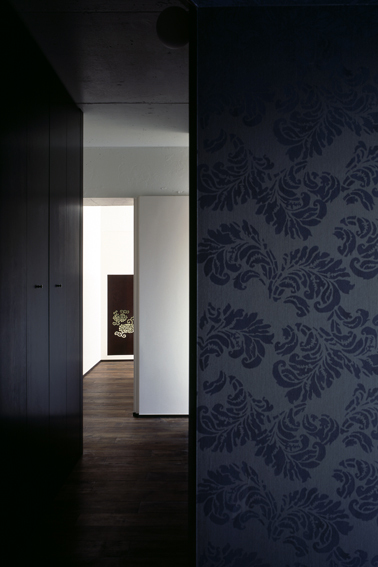 Patterned wallpaper and gridded doors create a finer sense of scale, one typically associated with furniture or clothing. 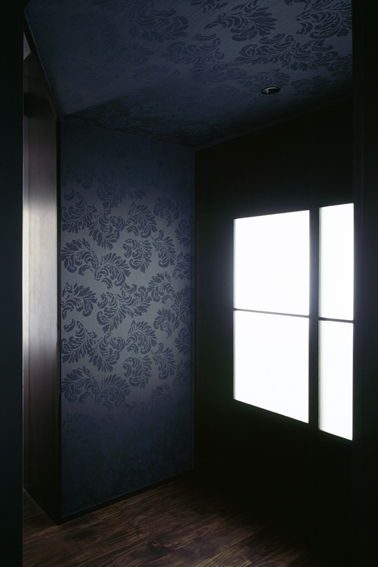 The sense of “hidden space” was created through darkness and extension. Darkness renders the contours of objects indistinct and blurs spatial boundaries. 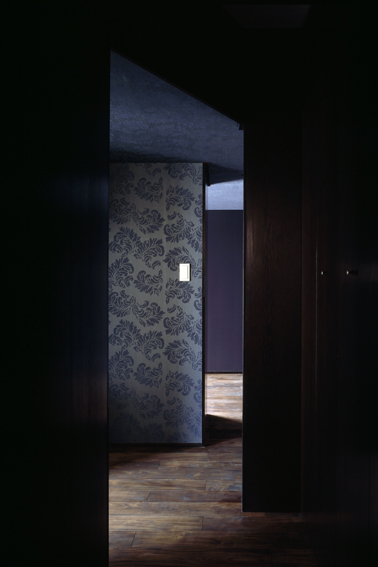 The deep purple walls blend into the darkness, while the arabesque patterns on the wallpaper float in the space; the eye has to strain to pick up the outline of everyday objects. Dividing and bending spaces – such that they cannot be grasped in a single glance – creates the sense of extension. The inability to see all the spaces in sequence creates a sense of expectation as one moves through it, reinforcing its bends and curves. Delicately scaled, hidden spaces create a sense of tension as we experience them – a break from our daily routines and expectations. 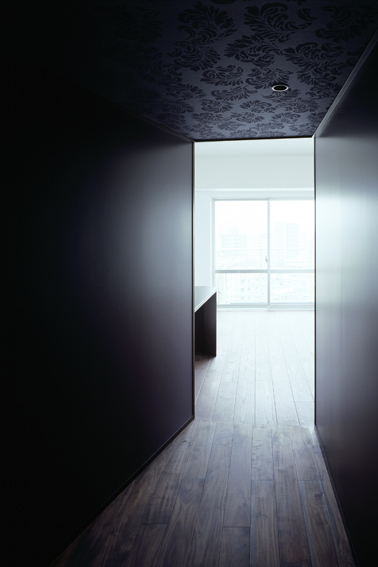 The transformation of the hallway into a darkened, delicately scaled, extended closet space creates a different time scale that contrasts with other spaces of the condo. With this project, we believe we have uncovered new source of interest and variety lying dormant within a standard Japanese condominium plan.